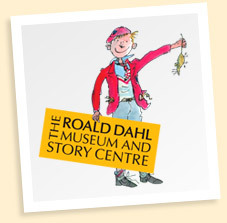 Tucked away in the heart of Great Missenden – the home of author Roald Dahl for over 36 years – is the Roald Dahl Museum and Story Centre. I recently took my three young children for a visit and I’d be hard pushed to say who enjoyed it more, them or I. Consisting of three main rooms (plus Miss Honey’s classroom which was used for various storytelling activities during our visit), the museum, whilst not huge, kept us entertained for hours and we only left when forced to, due to the museum closing. The Boy Gallery explores Roald Dahl’s childhood and combines enough information to satisfy adults (Roald’s childhood letters home from boarding school, details of his relationship with his Norwegian mother) and interactive displays for children; my three enjoyed dressing up in a school uniform similar to the one worn by Roald at Repton. A huge attraction of the museum is that the contents of Roald Dahl’s writing hut have now been rehoused in the Solo Gallery, with great attention to detail, all explained in an informative guide. Dahl surrounded himself with interesting objects and we were able to ogle at a jar of bone shavings (from his backbone! ), a part of his hip bone (removed during surgery) and a carved grasshopper sent to him by a long-jumper. The children dressed up as Roald Dahl during his stint as a fighter pilot and answered the quiz in the cockpit of the plane and we all loved measuring ourselves against the wall chart to see which character would have been our equal. My daughter was delighted to be matched against Matilda whilst I was less thrilled to be on a par with the evil Trunchbull! When we entered the museum the children were each given a ‘Story Ideas Book’ with activities and they used it to create a photo-fit character in the Story Centre. In this room the children were encouraged to get creative; they could make a stop-frame animation film, create their own popp-fizzling word and write a poem on the fridge, as well as listening to other authors talk about their inspiration for writing and their love of books. After a well-deserved break at Cafe Twit, where we indulged in Bogtrotter chocolate cake (cue photo of children with face buried in the cake) and Miss Honey’s lemon cake, we listened to the animated storytellers bring Revolting Rhymes to life. As well as visiting the museum we also followed Roald Dahl’s Village Trail around Great Missenden, seeing the Post Office where up to 4000 letters a week used to arrive for Roald Dahl. The highlight of the trail had to be a visit to Great Missenden library, visited by Matilda every afternoon while her mum was playing bingo in nearby Aylesbury. I think my children half expected to find her curled up in one of the chairs when we went in! There is also a longer Roald Dahl Countryside Trail which explores the countryside around Great Missenden and the woods which inspired Fantastic Mr Fox and Danny the Champion of the World.